Sean Rafferty presents top class live music from some of the world's finest musicians. Today's guests include Javier Perianes and Sir James MacMillan. 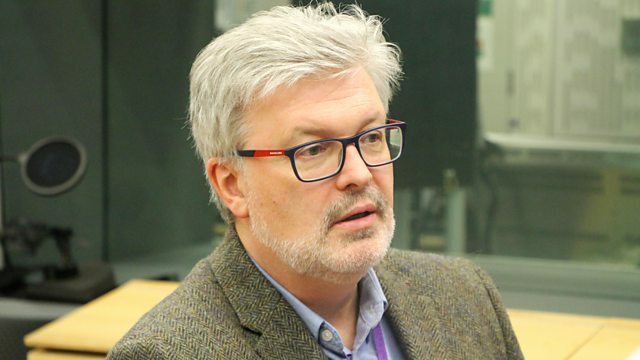 Pianist Javier Perianes performs live for us and we are joined in the studio by one of today's most successful composers and conductors Sir James MacMillan, as he takes part in the Holy Week Festival at St John's Smith's Square, for a special season marking his 60th birthday. The folk singer and instrumentalist Jim Moray also performs live. Choir: Rheinische Kantorei. Orchestra: Das Kleine Konzert. Conductor: Hermann Max. Conductor: Christian Benda. Orchestra: Prague Sinfonia. Singer: Janet Baker. Orchestra: English National Opera Orchestra. Conductor: Charles Mackerras. Conductor: John Wilson. Orchestra: BBC Philharmonic. Conductor: Nigel Short. Choir: Tenebrae. Ensemble: Hespèrion XXI. Director: Jordi Savall. Battaglie & Lamenti: Montserrat Figueras, Hesperion XXI, Jordi Savall. Performer: Anneleen Lenaerts. Music Arranger: Daniel Capelletti. Conductor: Adrien Perruchon. Orchestra: Brussels Philharmonic. Performer: Cappella Nova. Choir: Cappella Nova. Director: Alan Tavener. Tenebrae Responsories (and other works). Choir: Polyphony. Orchestra: Britten Sinfonia. Conductor: Stephen Layton. Schubert: Symphony no.9 etc: Budapest Festival Orchestra/Fischer. Music Arranger: Jim Moray. Performer: Jim Moray. Performer: Tom Moore. Performer: Matt Downer. Performer: Jim Moray. Performer: Matt Downer. Performer: James Ehnes. Performer: Eduard Laurel. Wieniawski, Sarasate: James Ehnes, Eduard Laurel.